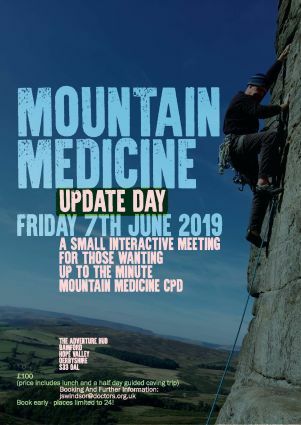 Our "Mountain Medicine Update" day will be held in the Peak District on the 7th June 2019. A flyer with details of the venue, cost and contact is pasted below. The plan is to get a small group (maximum 24) of fairly experienced mountain medics together for a morning of short presentations and discussions including - "Acetazolamide - Friend Or Foe", "Life After Warfarin - An Update On Oral Anticoagulation", "A Year On - Kilimanjaro Search And Rescue", "Sleep - The Key To A Successful Summit?" and "Scaphoid Fractures - Good And Bad" not to mention several others! The afternoon will be set aside for a caving trip that will hopefully provide a new insight into managing medical issues in the remote environment. A collaboration with the British Mountain Medicine Society (BMMS).